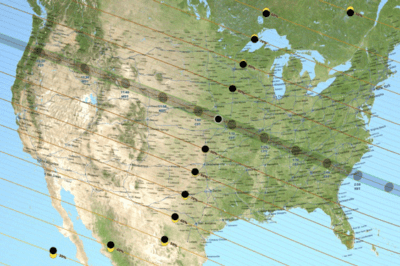 Screenshot from NASA's Interactive map of the path of the Total Solar Eclipse of 2017 Aug 21. The northern and southern path limits are blue and the central line is red. The green marker labeled GE is the point of Greatest Eclipse. The magenta marker labeled GD is the point of Greatest Duration. 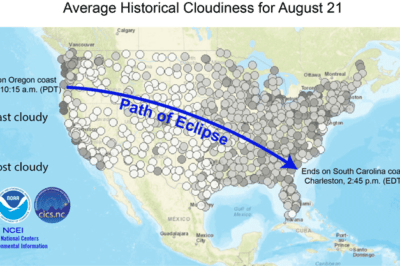 For the first time since 1979 a total solar eclipse will be visible from the contiguous United States on August 17, 2017. 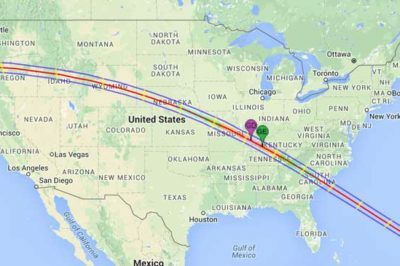 Called the Great American Solar Eclipse of 2017, the moon’s shadow track will only be visible in the United States.